We love the summer season, mainly for the prime opportunity to grill! There's something about grilling foods that really gives a rustic flavor. Cooking with fire doesn't get any more rustic than grilling, right?! One of the things we've grilled recently are Korean Kalbi, which are grilled short ribs that have been flanked (or cut across the bone so that each slice has a few pieces of bone - something your butcher can do for you.) 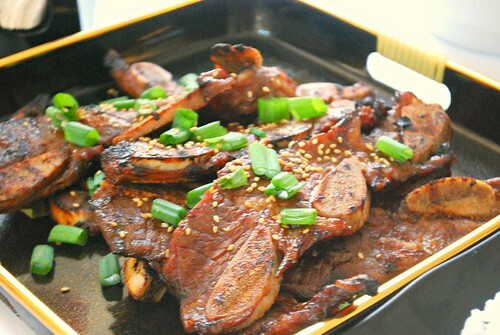 The marinade is simple with a combination of soy sauce, brown sugar, minced garlic, green onions, toasted sesame oil.... and the secret ingredient - Pear Nectar! The pear nectar helps tenderize the beef and adds a nice sweetness! I recommend marinating the meat overnight for maximum flavor... so plan ahead and give it the time it needs. If you don't have a grill, you can also bake the ribs on a baking sheet, in a 350 degree oven for 30-35 mins too. In a large bowl or stock pot, combine all the marinade ingredients and stir until sugar has completed dissolved. Add the short ribs and toss to coat. Cover with plastic wrap/lid, and refrigerate overnight. Preheat outdoor grill on medium high heat. Remove ribs from marinade and place onto hot grill, cooking until meat is medium rare - about 5-7 minutes per side. Discard marinade.